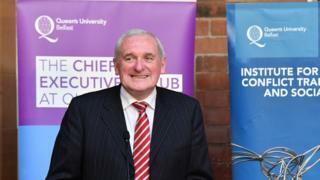 Former Taoiseach (Irish Prime Minister) Bertie Ahern has been appointed an honorary professor in peace studies by Queen's University. The professorship is attached to the Senator George J Mitchell Institute for Global Peace, Security and Justice. Mr Ahern served as taoiseach from 1997 to 2008 and was one of the architects of the Belfast Agreement. He will take part in workshops and classes with students as well as other university events. The former leader of Fianna Fáil will deliver his first lecture on 21 May, entitled "Peace Process - In light of Brexit Issues". Mr Ahern said he was privileged to accept the honour. The director of the institute, Professor Hastings Donnan, said Queen's was delighted to make the appointment. "Bertie Ahern has been an advocate and supporter of the Mitchell Institute and the university for many years and his political experience will be an asset to both teaching and research at Queen's. "We look forward very much to his contribution over the next three years." In 2018 former DUP leader and Northern Ireland First Minister Peter Robinson was appointed to the same role, along with former Sinn Féin MLA Mitchel McLaughlin, who was the first nationalist politician to serve as speaker of the Northern Ireland Assembly. In response to Mr Robinson's appointment, a number of staff at Queen's signed a letter questioning the former Belfast East MP's appointment. Anne Connolly, chairperson of the Northern Ireland Policing Board, and Dr Michael Maguire, Police Ombudsman for Northern Ireland, have also been awarded honorary professorships at the institute.